I wanted a set of irons that were custom made for me without the cost of name brand sets. I set out to my local golf shop and they had a set of these for 179. I was a little skeptical because I had never heard of Acer before. But I kept coming back to the clubs after practicing with other brands because I liked the weighted feel to them. Overall the clubs have a heavy feel to them, but once you start to swing them you get the feeling that the iron is actually directing you instead of you trying to direct it. Very hard to explain, but the final result is a straight shot that carries a lot of distance. I have to admit that I do not get a lot of spin out of the 7,8,9, and PW. But what you do get is a soft landing on the green that usually does not travel far after the second bounce. I also felt that there was a considerable amount of loft with each club. Even the 3 Iron had some loft to it that I was not expecting. My set also came with a SandWedge. This would have to be the best SW I have owned. It is heavy as you would expect, but it really cuts through the sand smoothly and creates a LOT of spin. If I am in the sand near the greean I would have to say that I have a 95-98% chance of making it out, I cannot remmeber the last time that I felt I was in trouble in the bunkers with this club. 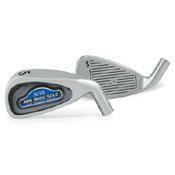 I would recommend Acer to any golfer that is looking for a great set of irons that would not break the bank. Also I feel that Acer is a brand of their own and not a company that is trying to sell TM or Calloway knock-offs. The Wide Sole knocked 10 strokes off my game. Where I was shooting in the low 100's to high 90's, know I am in the low 90's, high 80's. Your basic set of irons from your local sporting good store.